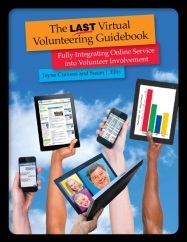 Jayne Cravens and I closed 2013 by finishing a new book, The Last Virtual Volunteering Guidebook: Fully Integrating Online Service into Volunteer Involvement, which will be available later this month. I’ll tell you more about the book towards the end of this Hot Topic but first I wanted to give some context on why the subject was worth revisiting. The first Web site was opened in 1991. That’s only 23 years ago, yet our world has already been transformed in profound ways. 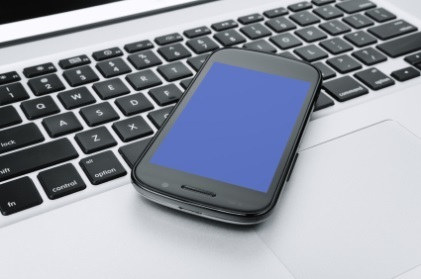 Electronic communication is here to stay, and increasingly mobile computing tools and smartphones are permanent elements of our lives personally and professionally. As always, volunteering was on the cutting edge of social change. First, volunteers played a critical role in creating the Web itself. And, they continue to help shape cyberspace today, particularly the open source programmers who freely share new ideas and applications. The Web enabled entirely new types of volunteer service that could be completed online. Quickly, this was dubbed virtual volunteering, even though the volunteers were not and are not “virtual.” Online service is done by very real people choosing to contribute their time and skills through the Internet. By 1996, Impact Online (out of which VolunteerMatch evolved) obtained funding for the Virtual Volunteering Project, designed to study the emerging trend of online service, identify successful early adopters, and produce a guidebook. They hired Jayne Cravens to direct the project and me to be its documenting consultant. Believe it or not, in those days our first question to audiences of volunteer resources managers (VRMs) was: “How many of you have an e-mail address?” It was satisfying to watch the rapid introduction of online tools that assisted VRMs in managing the administration of volunteer projects, but the very concept of engaging volunteers in doing online service was revolutionary to many and often met with skepticism. In 2000, Jayne and I produced The Virtual Volunteering Guidebook with the subtitle, How to Apply the Principles of Real-World Volunteer Management to Online Service. Today virtual volunteering opportunities are offered by many thousands of organizations of all different kinds and in all different places. Yet there are still holdouts who resist the concept. The vocabulary of online service is diverse and not everyone agrees on when to call it virtual volunteering, cyber service, Internet-mediated service, telementoring, micro-volunteering, crowdsourcing, distributed thinking, smart mob, or something else. However, from the perspective of volunteer management, it’s important to keep focusing on the element of service, not simply use of computer tools (e.g., volunteer tracking software to computerize recordkeeping is great, but has nothing to do virtual volunteering). 1. Offering people meaningful ways to contribute their skills and time via the Internet, whether by computer, tablet, smartphone, or whatever device comes next. If you wonder whether virtual volunteering can make a difference, look at the United Nations Online Volunteering Service that Jayne ran for several years. It matches volunteer experts in developed countries with people in developing countries needing all sorts of technical assistance. 2. Integrating online service into existing volunteer assignments already being done onsite in order to provide increased services and also to make life easier for both the volunteer and the VRM. In our original Guidebook and in all the training we’ve done since, we have emphasized the reassuring fact that the principles of good volunteer management totally apply to virtual volunteering, even if we practice them electronically. Despite the evidence that virtual volunteering is up and running in so many ways, misconceptions about who wants to serve virtually, what they can do, and the demands of coordinating their online work continue to concern some of our colleagues. For example, many believe that all virtual volunteering is done by people who live far away from the agency and so it will never be possible to see these volunteers in person. In fact, if you want to require that someone who will do a virtual assignment still has to come into the facility to interview and be trained, that’s fine (just recognize it means you are limiting the pool of potential volunteers to those who are in geographic proximity). Resistance to virtual volunteering is frequently connected to concerns about the Internet or social media in general. Is it dangerous to let volunteers interact with clients online? What about privacy and confidentiality? Will we lose control? Do we need advanced technical expertise or expensive software to do this right? Such apprehensions can be addressed and relieved, and should not become insurmountable obstacles. Jayne has compiled a list of myths about virtual volunteering, all of which can be disproven with better facts. For example, some think that online service is mainly for people who otherwise do not have time to volunteer or don’t want to volunteer face-to-face. Others believe that online volunteers engage primarily in technology-related tasks and can’t imagine them connecting directly with clients. Obviously, any book written in 2000 about the Internet is way out of date, so it was high time for a revision. In a few weeks, we will be delighted to announce the publication of what we have now named The Last Virtual Volunteering Guidebook: Fully Integrating Online Service into Volunteer Involvement. The subtitle reflects our firm belief that any effective volunteer involvement strategy should incorporate online interaction with and by all volunteers as a natural and expected part of operations. Some people will volunteer solely online, others will combine a virtual component with an onsite placement, and others may do their service totally hands on. But even for this last group, increasingly we can expect some Internet contact, whether in training, reporting, or simply to communicate information. The Internet is a tool to support all volunteers, regardless of their role in an organization or where they physically perform their service. Our goal is to get to the point where there is no longer any need for a special guidebook just for this subject. In the future, we hope all volunteer management books and training sessions will include online service as a matter of course, just as they already examine onsite and remote volunteering. That’s why we hope the new book is the Last guide to virtual volunteering ever published as if it’s a special topic. In the meantime, we have crammed the new book full of all the tips and suggestions we have gathered about how to support online volunteers – and provided you with the facts to counter those who still have concerns.. It’s not a technical manual, yet it will help both the tech-cautious and the tech-savvy to be comfortable with the many new Internet tools available. © 2014, Energize, Inc., 210 pgs. Where Are You on the Virtual Volunteering Spectrum? Let’s conduct an unofficial poll of the readers of this Hot Topic. Please respond to the three questions below and you’ll see immediately where you fit on the spectrum of responders. Please share your thoughts on and/or experiences with virtual volunteering below. What has worked really well? What has not? What concerns did you have that you were able to alleviate? What concerns do you still have? What advice to do you want to give to others who are still undecided about virtual volunteering? I believe that virtual volunteering is a resource that must be tapped in order to keep many organizations including ours going. Thinking outside the box about how I can engage people who are willing to contribute their time and talents to our agency without ever crossing our threshold is not as revolutionary as it sounds. Virtual Volunteering is alive and well. However, Volunteer Supervisors who supervise from a distance often struggle. Do you have some sage advice and guidance for them? You are correct that supervising online volunteers is a variation of working with remote volunteers. First it requires believing in the people you have recruited, trained and placed into volunteer roles, whether their work will be onsite where you can see it yourself, in the field unobserved, or accomplished via computer. Basic volunteer management tools are critical: specific position descriptions and clear product or activity goals, to allow the supervisor to monitor progress and give support; a mutually determined – and followed! – regular schedule for communicating together, whether by phone, e-mail, in-person (if really needed); reports of what the volunteer is doing. Today, free online resources such as Skype really provide ways to keep in personal touch with all remote volunteers. And you can recruit volunteer team leaders to monitor progress, too. These are exactly the sorts of tips and techniques we explain in The Last Virtual Volunteering Guidebook. As somebody who's heavily involved in the microvolunteering arena, via the Help From Home initiative, I'm seeing more and more innovative ways in which initiatives are trying to engage potential volunteers. This diversity and innovation will only increase as the domain of digital technology expands, eg wearable computing, QR codes and possibly even personal drones. Watch this space! We have about 200 volunteers who volunteer from home sewing, knitting, etc. We keep in touch by email. We do offer them quarterly Stitch-a-Thons at the hospital for those that want to touch base every so often. Some do, most don’t. The program has been in place since 2007. I believe virtual volunteering works because my first free website was designed and managed by a virtual volunteer from the US and it worked very well until I get my domain. I'm looking for virtual volunteer to my charity for fund development managers to research for grants opportunities, grant writing and applying grants. Virtual humanitarian food relief managers to mobilize for food relief, shipping costs, fundraising for food packaging events, etc.